Click here for general information on drilling holes in glass. Although it's possible to drill holes in glass by hand or with a stained glass grinder, the best way is to use a drill press. This basic shop tool, which consists of a stand, a holder for a drill bit, and a motor that turns the bit, excels at drilling holes in precise locations. A tabletop drill press is fairly inexpensive (generally well under $100 US), and should be more than adequate for drilling holes in small pieces, ranging from jewelry to several inches in width. Drill presses are sized by "throat capacity", which is a measurement of the distance between the column that holds up the head of the drill press and the center of the chuck that contains the drill bit. Most small drill presses have around a 3 to 4 inch (7.5 to 10cm) throat capacity, which means they can drill items up to 6 to 8 inches (15 to 20cm)in width. Larger items, such as sinks, require a drill press with a greater throat capacity (at least 20"). Otherwise, it's not possible to position the sink so that the center is below the drill bit. 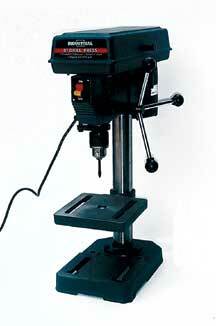 Drill presses with a throat capacity of 20" or greater can be quite expensive. Most drill presses are made for drilling in wood or metal, but they can be easily adapted for drilling in glass. The two key adaptations are the kind of bit used and the need to keep the glass wet when drilling. Click here for the next section of this tip, which is on choosing the right drill bit.